Chris Jackson Receives 1,000 Scholarship! We are excited to provide Chris Jackson of Dunbar High School with the Premier Health Flyin’ to the Hoop Scholarship present by River Valley Credit Union! Chris will soon be making his way to Urbana University and we wish him the best of luck with his academic and athletic career. Congratulations on the win and your $1,000, Chris! 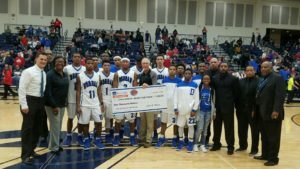 We are happy to provide Elgin High School (IL) with their first check for $500! Congratulations to Elgin and we are eager to send more revenue their way.